I met Jen and Lisa at the St. Paul Farmer’s Market this weekend and it was truly a treat to see all the goodies that are still available! Jen inspired me with her great photos from last week, so I brought my new camera and had some fun. I loved the way the sun was reflecting off these peppers. Hot! 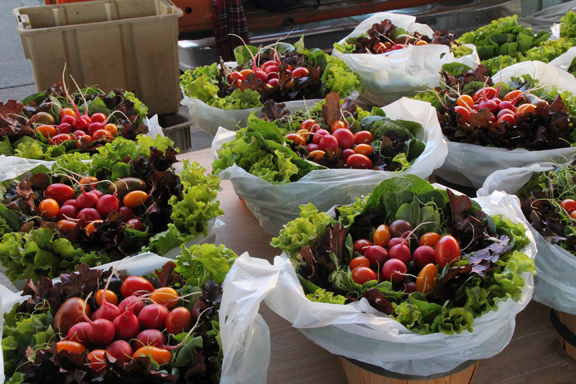 One vendor had made up these great baskets full of salad ingredients. Beautiful! And pumpkins. Lots of pumpkins. Orange! i roasted my root veggies, i put out my pumpkin, and i’m looking forward to having spaghetti with spinach and tomatoes for dinner tomorrow! thanks for the meet-up! Great photos Jennifer! It was a beatiful morning and nice to see you.